Casa La Barenda está ubicada en el corazón del centro histórico de Mérida, a poca distancia de restaurantes, mercados locales, plazas, museos, tiendas, teatros y todas las emocionantes actividades que se desarrollan en la Plaza Grande. Y es sólo quince minutos del aeropuerto internacional de Mérida! Los viajeros a Mérida descubrirá una ciudad vibrante y cosmopolita que conserva gran parte de su encanto colonial francés y español ... y Casa La Barenda está justo en el medio de uno de los barrios históricos con más encanto, de Santiago. La casa tiene dos dormitorios con baños en suite, una piscina de inmersión, cocina y amplias áreas de comedor y sala de estar, y un cómodo estilo de vida interior / exterior. 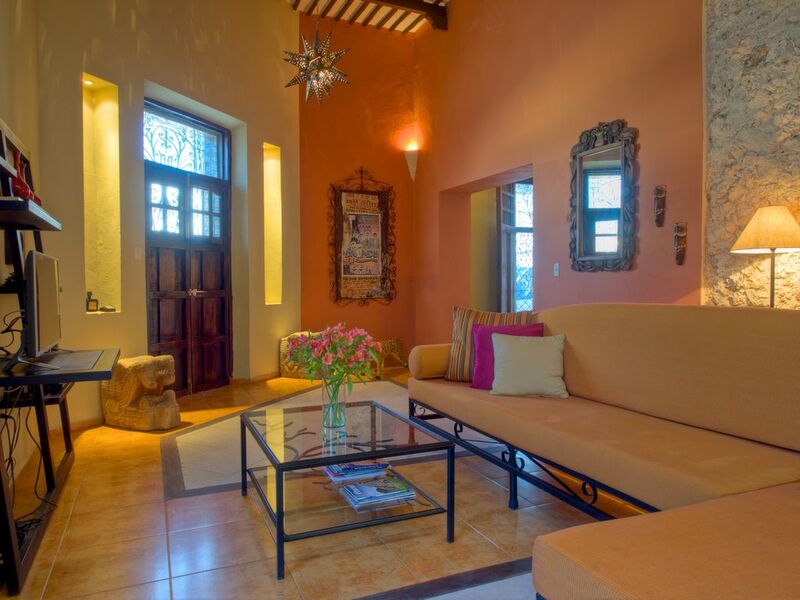 Casa La Barenda es una base excelente para explorar las ruinas mayas, los cenotes, las cuevas, las haciendas, las iglesias coloniales, los santuarios de aves, los pueblos pesqueros y las playas de arena blanca y suave cercanas. Es una gran aventura en Yucatán, si quieres que lo sea, y ciertamente no te faltarán cosas que hacer ... ¡aunque no sea nada! Esperamos que encuentres tiempo para relajarte y descomprimirte en la casa también. Duerma en cómodas hamacas hechas a mano: caliéntese o haga yoga en el salón de la azotea mientras disfruta de la brisa de temporada y las vistas de la ciudad. Abre una cerveza artesanal local, o mezcla una Margarita y relájate en la terraza de la piscina. Reflexione sobre el día y deje que los encantos de Mérida se hundan. Casa La Barenda y Mérida te esperan! Su asistente personal está disponible para cualquier servicio adicional como compras antes de la llegada para surtir la nevera, excursiones, masajes ... solo pregunte. Palabras clave: Casa de alquiler vacacional, Yucatán, Mérida, Maya, Casa colonial. Cabina de duchas con asientos. Tenga en cuenta que la plomería de toda la ciudad es sensible en Mérida; todas las viviendas en el centro requieren la eliminación del papel por separado. Disfrutar de vistas a la ciudad de la zona de salón en la azotea y una pérgola. Asegúrese de preguntar acerca de los servicios que no se muestran que le gustaría tener a un costo adicional: la administración local puede ayudarlo con cualquier cosa: almacenar la nevera con sus favoritos, proporcionar teléfonos celulares locales, cocinar en la casa, entrega de alimentos, masajes, visitas guiadas, Taxis, consejos de expertos, etc. Tenga en cuenta que el uso de electricidad no está incluido en sus tarifas de alquiler. Por favor, también nos encontrará en: www. CasaLaBarenda. com. Lovely home in a very good location, walking distance to everything. We were really happy with our stay here. The location was excellent and it was an easy walk to anywhere in centro, including the Grand Plaza, and even the Paseo de Montejo. The rooms were large and tastefully decorated, the pool and patio area were a nice, comfortable place to relax in the middle of the day or evening, and the rooftop patio was a real bonus! I'd definitely recommend it!! We really liked this casa in central Merida. I especially loved the modern and traditional design touches in the home. The living room and bedrooms are especially lovely, and the bathrooms are modern and nice. We made ample use of the pool, the patio, and the rooftop spaces. Our host and the rental company were very helpful and responsive. The information about the house and the neighborhood provided by our host were very useful. We appreciated the restaurant recommendations and found plenty to do in Merida and the surrounding area. I'd go back and stay here again! Thank you for sharing. We look forward to your return! We stayed at Casa La Barenda May '18. The house itself is very clean and is decorated with regional themes/items throughout. We loved the rock walls, the tall ceilings and the lighting throughout the house. The completely private pool in the middle of the house was fantastic after the hot Yucatan days (May is pretty warm) and cooler evenings out on the squares. Not to mention the rooftop terrace to lounge after you get out of the pool plunge. All the major squares are very walkable from the property and there is something organized going on every single night on at least one of these squares. Lots of shops, restaurants, bus depots, ubers, taxis and horse carriages nearby. If you are looking for a two bedroom house with multiple living areas to be immersed into Merida Living, you have found it. Thanks so much for sharing your experiences at the casa and around Merida! Hope to see you back this way! My friends and I rented this house for a week over the Easter Holiday. It is a lovely interior and great size for 2-4 people sharing. It had everything we needed and the management hosts were very attentive, checking in when needed. The house is on a busy corner but the double glass on the windows worked well to block out noise and we were never kept up or bothered by street noise. The location was fabulous. Only a 5 minute walk to the main square, Santa Lucia square and Santiago Square and just 10 minutes to the Paseo Montejo and Santa Ana square. It made getting around a breeze and going back to the house in the hot afternoons for a swim break perfectly doable. If I had to make any suggestions it would be that there is not as much airflow in the house as there could be due to the glassed in windows. However, there is air conditioning in all rooms and the cost was not high for the week of electricity so all in all a great experience. Thank you very much! Thanks so much for your post during such a special time in Merida. A quick look at the emailed Welcome info FREE with every booking provides super helpful tips on orientation and fun, new, and one-off things to do you won't find anywhere else. Good location near the center. Casa La Barenda está cerca de los sitios arqueológicos mayas, museos, restaurantes, galerías de arte, música, teatros, iglesias coloniales, fortalezas, plantaciones, haciendas, santuarios de aves, Cenotes, cuevas, playas y mucho más. CHECK IN: The house is available for check in after 3pm. Check out is 11am. Depending on the availability of the home, I am happy to accommodate an early check-in or later departures by prior arrangement. REFUNDABLE DEPOSIT: Assuming no damages, your deposit will be returned to you at the end of your stay, minus a charge for electricity used during your stay (meter is checked on arrival/departure). For stays of longer than one month the refundable security deposit is 500 US dollars. For stays longer than 3 months, the first and last months rent will also be due in advance and gas usage will also be payable by guest. ELECTRICITY: Guests will be charged for electricity usage. This is standard practice in Yucatan and is based on actual consumption. The meter at check in and on departure and the cost will be deducted from your deposit. SERVICES: Complimentary weekly housekeeping, pool and gardening service are included for all reservations. (1 service every 7 days). SMOKING: Smoking is permitted in the outside terrace or rooftop only please. OCCUPANCY: The house is rented on the basis of the people listed on the agreement up to a maximum of 4. No extra overnight guests are allowed without the permission of the owner. The house is not designed to accommodate more than 4. PARTIES/EVENTS: Absolutely no parties or events are permitted in the house. NO BUSINESS IS TO BE CONDUCTED IN THE HOUSE RATES ARE QUOTED IN USD.